Plan with one night lodging and two meals included. This plan comes with free admission tickets to the public outdoor baths in Kinosaki Onsen. 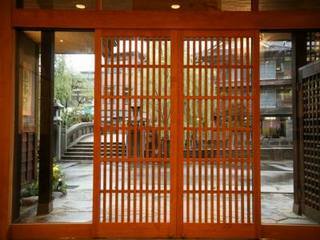 Guests may borrow a yukata (cotton kimono) from the inn. 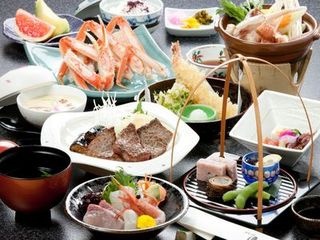 Yamamotoya uses local products for its dishes, such as locally caught fish, crabs caught in the sea around Japan, genuine Tajima beef, which is famous for its tender deliciousness, and local beer brewed at its own brewery. Relax and enjoy delicious foods from the local areas in your room. An example of Japanese-style Kaiseki dinner. We use local ingridients caught in Tajima area. This is our tea-ceremony room. Please feel Japanese culture here. 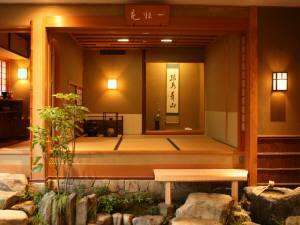 Yamamotoya is in a convenient location at the center of Kinosaki Onsen, allowing you to visit all of the seven bathhouses on foot. Why don't you do public bathhouse touring wearing a comfortable yukata? Yukata is a light Japanese robe. You can choose one you like from 100 varieties of yukatas. Don't worry about how to wear a yukata. A "nakai-san" serving lady will show you how to put in on. 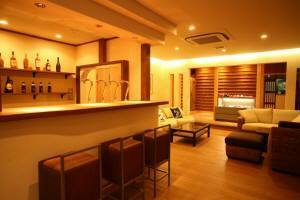 The rental fee is 525 yen. Check-in is 3:00pm and Check-out is 10:00am. Dinner is normally served promptly at 6:00pm. Please be careful to be back to your room at this time. Cancellation fees start 3 days before reservation date.